Please do not eat hard foods such as nuts, ice, crisp taco shells, whole apples and carrots (cut them into pieces first), hard bread crust and rolls, spareribs, corn on the cob (cut the corn off the cob before eating), and popcorn. These foods risk breaking brackets and wires. Also beware of nail biting and pen or pencil chewing habits, since these can damage your braces. 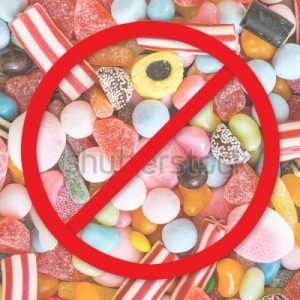 Do not eat sticky foods: taffy, caramels, gum or sticky candy of any sort. Use common sense about most foods. If it’s hard or sticky then stay away from it! Check braces once a week for anything loose or bent. If a bracket or band comes loose or you break a wire, please call our office so that we can arrange an appointment that is long enough to repair it. Try to explain what has happened by using the diagram provided. Be as specific as possible with the receptionist. If you lose your rubber bands, call us so we can mail you some more or drop by the office and pick some up. After braces are placed in the mouth it is normal for the teeth to be sore for about 2 or 3 days. Tylenol or Advil will help relieve this discomfort. Some irritation to the cheeks and tongue is normal, but if you feel anything sharp is poking you or any sores are developing, please call our office at 707-762-0211. You are responsible for placing the elastics on your braces between appointments. Make sure to wear them as instructed. Remove them only when brushing your teeth, gums and braces after meals. Then put them back on immediately. Always carry a few elastics with you, so if one breaks you can replace it right away. If your supply is low, call the office and we will mail you an additional supply of elastics. If you forget to insert your elastics one day, don’t double up the next day- just follow your regular instructions. If your elastics break frequently, a wire or band loosens, or a hook breaks off – call our office. Don’t wait until your next appointment. These problems need to be corrected as soon as possible! The removable appliance is carefully designed to move or to hold your teeth. It is important that it be worn according to instructions and be brought to each appointment. Your new appliance may make your teeth sore for a day or two, especially after an adjustment. If you have a sore spot on your gums call our office so that we can adjust the appliance. Clean your appliance by brushing it daily with toothpaste. If you are wearing a bonded wire retainer behind your front teeth, be extra careful to clean the wire and the area around it. Flossing should be done every day. Never wrap your appliance in a paper napkin or tissue and set it down on the table. You or someone else may throw it away. Don’t put it in your pocket when playing or you may break or lose it. Whenever it is not in your mouth it should be in its case. Keep your appliance away from dogs or cats as they love to chew on them. Avoid storing them near any source of heat. Do not boil your retainer to sterilize it because it will distort or melt. If your retainer needs to be disinfected then you may use 1/8 cup of bleach to 1 cup of water. Rinse very thoroughly with water. After you first get your braces on or have an adjustment your teeth will be sore for a few days up to a week. This is your teeth moving! Take aspirin, Tylenol or ibuprofen (unless allergic) to lessen the discomfort. Rinsing your mouth with a saltwater (1 teaspoon of salt with a cup of warm water) can also be soothing and toughen your gums. Teeth can get sore even after a few weeks after an adjustment. This occasionally occurs because a tooth or teeth are delayed in moving. If a wire causes irritation, push the wire away from the area using the eraser end of a pencil or a Q-tip. If the wire cannot be tucked away, cover the end of the wire with a small piece of wax, a cotton ball, or a piece of sugarless gum, until you can be seen in the office for an adjustment. If the main wire has come out of the tube on your back molar tooth, attempt to reinsert the wire with a pair of needle nosed pliers or tweezers. If the wire is not sticking you, place a piece of wax over the area. If the wire is sticking you and wax does not help, the wire can be cut with a small wire cutter or toenail clipper close to the back of the last brace. This is a last resort if professional help is unavailable. In case a rubber spacer falls out, take two pieces of dental floss and insert them through the spacer. Pull on both pieces of floss to stretch the spacer then slide the spacer back and forth between the two teeth where it belongs. Once the bottom half of the spacer slips under the tight spot between the teeth, release and remove the floss and the spacer will fit back properly. If a piece of your appliance breaks, save the piece and call our office to schedule a repair visit. If a retainer cracks, remove the retainer from your mouth and bring all the pieces to our office for professional repair. This is not an emergency. Call the office for a appointment during regular office hours. If your retainer is rubbing your gums call our office for an appointment so that the retainer can be adjusted. Do not continue to wear the retainer until it causes a sore. If it only causes a sore after wearing for a period of time, then wear the retainer for short periods until you can be seen so that the retainer continues to fit. Salt water rinses will help minimize the irritation. If possible the retainer needs to be adjusted within a week so that your teeth won’t shift.